At the start of the 15th Johor Arts Festival on September 1, it looked like weeks of shows and activities were all lined up ahead – and I made it to most of them – but all too soon, it closed with the grand finale of Perspective: The Runway, a fashion event. Samba, by strumming their stringed instruments! Looking back to Day One of the 15JohorAF – but even on a Saturday evening – I thought the audience could have been much larger. “JB arts enthusiasts, where are you?” this refrain echoed in my mind. I’ve had a long day and rushed over, hoping that I would not be late (I dislike missing a moment of any live show!) and was deeply saddened to see that the folks in Johor Baru did not make an attempt to turn up for this show. As I watched, seated in pitch darkness, I just wished fans of contemporary theatre had availed themselves the opportunity to watch this talented writer and performer. As the show unfolded, I forgot all else but the mesmerizing monologue in, Kulit On The Go, that featured an impressive performance by Erwin Shah Ismail, a one-man act who performed in English, Malay, Mandarin and Hokkien, and he even sang while strumming the ukulele. I felt that I was part of history-in-the-making because Kulit On The Go had the potential to develop into something huge – just like how Emily On Emerald Hill did – and I was blessed with the privilege to watch the 200th performance by Pearly Chua last year. On Sept 3, I reached the Persada Johor International Convention Centre for an evening of classical music with the Malaysian Philharmonic Orchestra, and joined fans of classical music to park at the adjacent multi-level carpark. To skip the queue for paying the parking ticket after the show, I remembered to use my trusted Touch ‘n Go cash card because this carpark has such a convenient facility! It was good to have a printed programme for the evening’s performance entitled, From Mozart to Totoro, which gave me a guide to how the orchestra started with Mozart’s Overture to The Marriage of Figaro and ended with Music from My Neighbour Totoro by Hisaishi. conduct the final piece in their performance here. Conductor, Naohisa Furusawa, showed his playful side when he donned a costume that resembled the title character, Totoro from the 1988 acclaimed animated tale, when he conducted the final piece in the evening’s performance. While the hall seated the audience quite comfortably, it was still not an ideal setting for an orchestral performance. I must admit that I only listened to the music because I could hardly see beyond the first few rows of the orchestra as the brass and percussion sections were hidden from view. From my seat, I could just peek in between the pianist and violinists to see a bit of the harpist and xylophonist in action. It was some time since I last enjoyed a show performed by Ajith Baskaran Dass, Bharata Natyam dancer and choreographer extraordinaire and his Suvarna dancers as their shows were mostly staged abroad or in other cities. And when I discovered that he was presenting Much Ado About Dance or M.A.A.D. on Sept 7, I made sure that I was there. In typical Ajith style (who wanted his audience to be better informed about the performance), the event opened with a pre-show interview-chat where he shared some insights into his role in Suvarna productions and the art of Bharata Natyam. I thoroughly enjoyed the dance programme which showcased various genres of the classical Indian dance performed by some of Suvarna’s talented dancers as groups, a couple and in solo. Having been to many of Suvarna’s annual shows, I’m familiar with the dancers and observed how they have matured and continue to excel in their story-telling through portrayal of characters, facial expressions, movement and mime. I particularly liked the ‘couple dance’ and watched with bated breath, deeply entranced by their performance – until the gentleman next to me – elbowed me to get my attention and told me that the couple were in fact, husband and wife. I nodded because I already know. They are Vijay Chandran and his wife, Suzatha Suppiah. No thanks to him, my pleasure in watching this performance was rudely interrupted! My brother and his wife, who were visiting from Kuala Lumpur, joined me on Sept 9 for Tarakucha! big band in their Tarakucha! show. They fondly remember Sean Ghazi's performance in the staging of the West End theatre show, Miss Saigon, and were thrilled that their visit to JB coincided with 15JohorAF and his show here! All of us enjoyed the show because the ‘big band’ did a good job to complement the flawless vocals of Sean Ghazi and Ida Mariana. My brother and I, however, agreed that the duet performances could have been more engaging if the artistes connected better with each other while performing. From the collection of photos I have, I only managed to find one shot – only one – where Sean and Ida actually looked at each other while singing a duet. If I needed to capture some photos to post with my stories, I will use my camera to discreetly snap with no-flash or if necessary, raise my arms and drop them quickly. While almost everyone is armed with a sophisticated mobile device that can capture vivid shots and exciting videos, there is a common courtesy about using your devices during live performances. In spite of the constant reminders from the organisers that NO Videography is allowed, there are recalcitrant people who still insist on filming videos with their mobile-phones. The very act of videoing a live show is already against the house rules but the duration in which their device is being held up – sometimes blatantly high – that it blocked the view of the audience behind, is just plain rude. Breaking the house rules is one matter but blocking the audience behind you, is disrupting their pleasure of watching a live performance for which they paid tickets to enjoy. Taking away their right to the pleasure of watching a live show is downright wrong and for such careless and inconsiderate behavior, I believe the organisers have the right to simply remove these culprits from the hall! For some shows, there are also Copyright laws to abide by and it’s just wrong to try to video or film when you were clearly told not to. So if you are guilty of such inconsiderate behavior, please STOP IT. In 2015, at the 12th Johor Arts Fest, I had the privilege to meet with the creators of Fusion Wayang Kulit and watched their performance of Peperangan Bintang Wayang, their wayang kulit or shadow play rendition of scenes from the epic, Star Wars. So on Friday afternoon Sept 14, I found my way to the Workshop-Exhibition-Performance event to meet with the creators of Fusion Wayang Kulit, Tintoy Chuo and Pak Daim, the Tok Dalang or master puppeteer. A series of loud knocks, “Tok Tok Tok” greeted me and then I discovered that it was the sound of hammering during the design and construction of shadow play puppets. Tintoy Chuo holding up a shadow puppet - Recognise him? Admiring the display of shadow play puppets set up with labels, I smiled as I recognised familiar Star Wars characters that were given Malaysian identities with names like Perantau Langit (Luke Skywalker) and Sangkala Vedeh (Darth Vader)! The creativity of Tintoy and his team seemed to know no bounds because they have proudly created an additional character who was quite easily identified, not just from his outfit and spectacles, but also from his pair of low-budget footwear! For reasons beyond my control, I had to miss some of the shows but I made sure that my trusted sources would share with me, a brief summary of what happened at the shows. One of the shows I had to miss was Malaysia’s Queen of Comedy, Joanne Kam Poh Poh. She was described as bold and outrageous and her event poster for Joanne Kam: La La Lian nationwide tour had three more adjectives to describe her show: Fierce, Funny, Fabulous. So prior to the show, I gave two friends (who were going to her show!) the challenge to tell me about the show later, by using only adjectives. The very next morning, I received one feedback with four words that read: Brilliant. Witty. Raw. Honest. Then I received the other friend’s comments which gave me a clearer picture of what went down in Joanne’s show. When I read the words: Entertaining, inspiring but sad, I thought that Joanne was very brave to share the story of her life’s journey through her show. Her painful experiences are nothing to laugh about but she was clever and courageous to turn these around to her advantage and come out on top! On Sept 21, my friends and I were all set to be enthralled by the Vision String Quartet who were here to entertain us, all the way from Berlin. Among us, the two who are formally trained in music admitted that they are great fans – and one of them even broke down and confessed that she had been ‘stalking’ them on You-Tube recently – and could hardly wait for the show! In the second half of the show, the audience was treated to the music of Mendelssohn. From where I was seated, I could see their facial expressions and observed how passionate these musicians were performing. Very often, the strings on their bows would snap from the sheer energy they were exuding and they discreetly plucked away the stray strands (of horse hair) as they went on playing – standing up and without any music notes – as they played music from their hearts. Thanks, JSPA for bringing us the 15JohorAF! The young musicians clearly connected with the audience when they performed their own composition, Samba, but for this, they strummed their stringed instruments instead of using the bows! It was my privilege to enjoy such an inspiring performance from the young musicians but I just wished that more local music schools – teachers and students – watched this show and seized the opportunity to be inspired by these music virtuosos. Shows and events have been brought almost to your doorstep BUT where are you? So another Johor Arts Fest is over. Meanwhile I’m anticipating the next event in the Johor Society of the Performing Arts (JSPA) Calendar of Festivals for Jazz, Film, Indigenous, Classical Music, Piano, Writers & Readers, and other exciting stand-alone events. For more info, visit Facebook: www.facebook.com/johorperformingarts. Students from Sekolah Kebangsaan Taman Universiti Two joined the team at Pulai Springs Resort to celebrate Malaysia Day 2018 in a morning of fun-filled activities to instill a spirit of patriotism and togetherness. The event kicked-off at 9am with Larian Anak Malaysia, a short run through the resort grounds that was flagged off by resort general manager, Sunny Soo, and witnessed by the school headmaster, Zulkiflie Miswan. Accompanied by their teachers, some 30 students from Year Three to Five classes raced along the trail, competing with each other with eager enthusiasm, even though it was just a fun-run. The day’s activities was part of the resort’s Corporate Social Responsibility programme with the local community, that invited the students to join the resort’s Malaysia Day celebration which aimed to inculcate a love for the nation from a young age. The weather was still bright and sunny when the students came racing back to the finishing point and were loudly cheered and congratulated by the resort GM, their headmaster, members of the resort’s Sports & Welfare Club committee and resort associates. 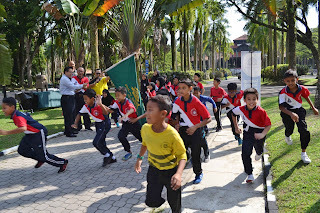 While everyone who completed the course was already a winner, the top three who finished the race in the shortest time were Danish Ammar Haziq (Year Four) in first place, Mohd Yusof Azmil Faiz (Year Five) second place while Rubenraj Poovanesan (Year Four) came in third place. The students were then ushered indoors where a 15 feet x 5 feet plywood base was prepared for them to create a National flag using 1,316 pieces of foam tumblers. Guided by the resort associates, the students used paint brushes to paint specific numbers of the tumblers in Red and Blue colours. “This is the fourth time the resort is organising a Malaysia Day celebration with students in the community we work in and through these activities, we wish to encourage the spirit of patriotism and promote a love for the nation,” said Soo. It was no easy task to paint the tumblers and handle the wet paint without getting their hands stained but it was all in good fun. Yet the student were game to complete the painting of hundreds of tumblers and once these were sufficiently dry, they were guided to use a glue-gun to carefully apply glue to the mouth of the tumbler. Along with White (unpainted) tumblers, the Red and Blue tumblers were then assembled on the plywood base accordingly to create a giant National flag. At first the plywood base was laid down on the ground for the top-most rows of tumblers to be attached on but once this was done, the base was raised up on its legs and propped up against the wall for the students to complete the flag design. The resort associates were on hand to help the students complete the assembly of rows upon neat rows of tumblers before the Yellow star and crescent were finally affixed to complete the design. The guests were then invited to the prize-giving where every student received a certificate of participation, a miniature National flag and a goodie bag filled with snacks, stationery and story books sponsored by the Pelangi Publishing Group. In addition to this, the top three winners who completed the Larian Anak Malaysia fun-run each received a medal and a food hamper. The students were treated to a delightful lunch of chicken rice as the main course along with pastries and fruits for dessert. One for the album: Happy Malaysia Day 2018! It was indeed a meaningful and memorable Malaysia Day celebration at the resort and with so many photographs to capture the moments, the students and their teachers will certainly remember this day long after it was over. 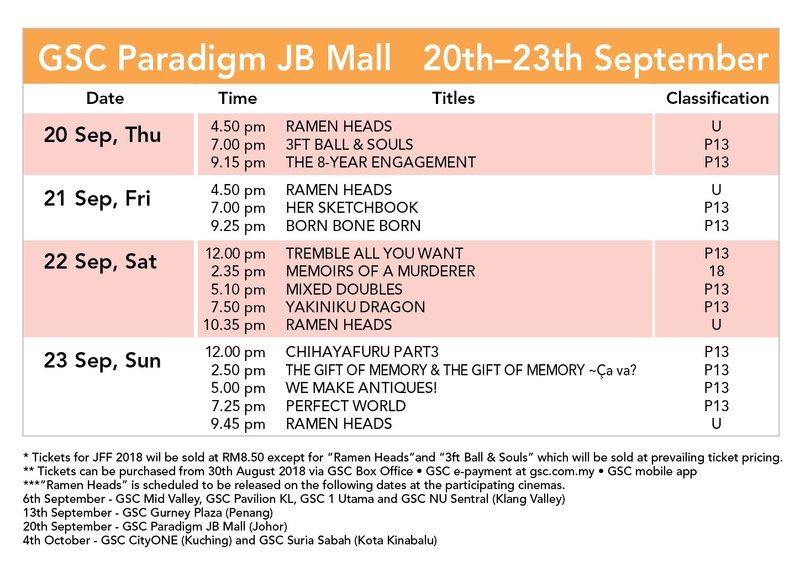 For the first time in 15 years, the exciting Japanese Film Festival (JFF2018) finds its way to Johor Baru and partners with Golden Screen Cinemas (GSC) at Paradigm JB Mall to screen a collection of 13 movies from now till Sept 23. In a screening schedule from Sept 20 to 23, selected GSC theatres will feature a collection of 13 recent Japanese movies in various genres including drama, suspense, comedy and documentary. When I received the invitation to the official launch event at GSC Paradigm JB Mall, I read the small print and realised that the JFF2018 had already kicked off in the Klang Valley and went on to Penang before arriving in JB. After JB, the JFF2018 will head east to showcase this year’s featured movies in Kuching (GSC CityOne Megamall) and Kota Kinabalu (GSC Suria Sabah) from Oct 4 to 7. Residents of the Klang Valley are often always the first to catch the best of Japanese motion pictures but I’m glad that movie buffs in JB finally have the privilege to share the experience, albeit just a little later. Organised by the Japan Foundation Kuala Lumpur in partnership with Golden Screen Cinemas as venue provider, the JFF2018 is supported by the Embassy of Japan, Consulate-General of Japan in Penang and the Consular Office of Japan in Kota Kinabalu and the Japan Club of Kuala Lumpur. The Japan Foundation is a non-profit organization established in 1972 with the aim to promote mutual cultural exchange between Japan and other nations. The KL office was established in Oct 1989. I cannot forget my first encounter with the Japan Foundation in Oct 2016 at the Mall of Medini when the Japanese art of puppetry known as Bunraku was presented in JB along with Teochew ‘iron-rod’ puppets, in an Asian Traditional Puppet Exchange. And even though I received the invite at the proverbial eleventh hour, I’m glad I had the privilege to enjoy this enriching and most entertaining cultural presentation. Read about the Art of Asian Puppetry. I’m familiar with the work of the Japan Foundation and am happy to join them for JFF2018 at GSC Paradigm JB Mall for the official opening event, graced by Johor Women Development & Tourism Committee chairman, YB Liow Cai Tung. The event kicked off with light refreshments – an elegant Japanese buffet courtesy of Sumawo Catering Service – while waiting for guest arrivals before being ushered into the theatre upstairs. Once the audience settled into the comfortable seats, a short video was screened with scenes of past Japanese Film Festivals with a collage of photos that depicted the audience, cinema lobbies and guest appearances of some popular Japanese movie stars. Director of Japan Foundation KL, Horikawa Koichi, gave his opening speech which was punctuated by another short video that showcased the list of 13 movies to look out for in the JFF2018. Top of the list is Ramen Heads followed by 3Ft Ball & Souls. These English titles may be paraphrased to summarise the original Japanese movie titles and while they may not sound as catchy in English, I must say the movies must be worth a watch in spite of their strange sounding titles in English. I can, at least, vouch for the movie entitled, We Make Antiques! because the entire movie was screened as a preview of the shows in store for the JFF2018. An exciting scene from the movie, We Make Antiques! For non-Japanese movie connoisseurs like me, English subtitles are essential for a better appreciation of the dialogue. Even for movie buffs who are not conversant in English, I believe they too can enjoy the scenes that portray typical Japanese culture from views of the Japanese streets, building architecture, homes and gardens, which are totally alien from ours in Malaysia. Of course, there may be some similarities – like sitting on the floor – but there is a great deal more to appreciate about Japanese culture and heritage from their food, customs and traditional costumes. The JFF2018 is in JB for the very first time, not just the Japanese community here, but also for everyone who enjoys Japanese culture and those who wish to learn more. On a practical note, Paradigm JB Mall may be unfamiliar to many movie-goers so here’s a tip for those who drive. If you are going for the late shows, please drive all the way up and park at Level 7, the same level where the theatres are located. 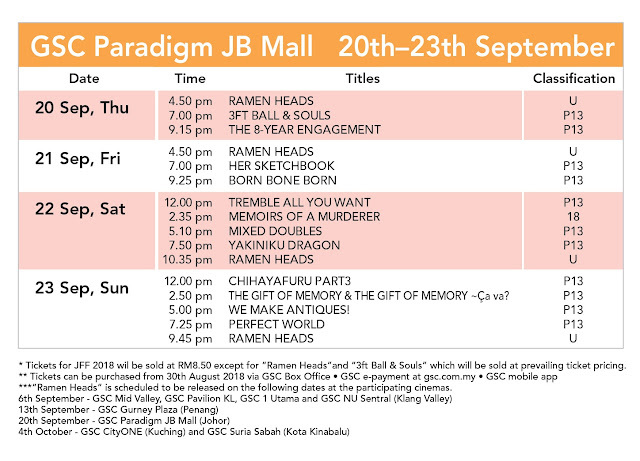 Tickets for all the shows in JFF2018 are priced at RM8.50 only while the tickets for two movies, Ramen Heads and 3Ft Ball & Souls, are at prevailing GSC ticket prices. Tickets can be purchased through the GSC box office, ticketing kiosks, GSC e-Payment at gsc.com.my or GSC Mobile App. For more info, visit www.jfkl.org.my and GSC website for ticketing information. The authentic looking miniatures of the Sultan Ibrahim Building on Bukit Timbalan, the Datuk Jaafar Building on Bukit Senyum and the Sultan Abu Bakar Mosque on Bukit Redan, are some of our city’s iconic and most familiar landmarks in the Johor Baru cluster within Legoland Malaysia Miniland. The JB cluster was created by a team of 35 Lego model builders, most of them locally trained since the inception of the Malaysian chapter of Merlin Magic Making (MMM) Studios, a facility that was first opened at Gelang Patah in 2009. MMM Studios, the Global Creative Division for rides and attractions development is known as the magic behind all Legoland parks because this is where science and technology brings Lego miniature landmarks and familiar scenarios to life. When the studio recently relocated to I-Park, Indahpura near Kulai, I was among the privileged few invited for its official opening on 27 July 2018 and a behind-the-scenes tour of its facilities to see where the Lego magic happens. I was impressed that this new facility has an increased capacity to support the growing demand for Lego models in the region. It was fascinating to learn that the work of this studio in Johor was not only to support Legoland Malaysia but also extended worldwide to other parks like Legoland Dubai and Legoland Japan! Escorted by local model builders and master model builder, Stefan Bentivoglio, we saw some of the exciting new developments for the park, all in various stages of production. It was good to meet a number of local talents engaged in the wide range of work processes in the studio and for them, handling Lego bricks every day was simply all-in-a-day’s work! As I observed the teams working on their computers and in the model construction, I saw that it was not just fun and games but a great deal of science, technology and engineering that went into each of the production processes. I remember the scene in Lego Miniland created for the Taj Mahal and in its foreground, a group of dancers does not remain static but would dance at the touch of a button. The animation of the Lego dancers clearly enhances the visitors’ pleasure and this was the successful results of the work put in by an engineering team. In the studio, there were teams involved with electrical work, responsible for bringing Lego scenes to life with creative lighting. Electrical work was an essential task in the scenes for indoor settings, including those recreated in the Lego Star Wars Miniland. It must have been fun, challenging and a lot of work to replicate this exciting showcase of over 2,000 detailed models including iconic scenes from all six episodes of Star Wars movies and The Clone Wars animated series. Looking back to a sunny day on 2 December 2009 and that brown field in the 76-acre site of Medini North in Iskandar Malaysia, I remember being among the media and others shaded under several tents pitched there for Legoland Malaysia Resort’s ground-breaking ceremony. The ceremony gimmick was for then Johor Menteri Besar, Datuk Abdul Ghani Othman to shift a lever in the hydraulic excavator to tip its bucket filled with thousands of multi-coloured Lego bricks and let them fall to the ground with a mighty crash! On 1 September 2012, I was again among a host of local and international media who were eagerly waiting to experience the first Legoland park in Asia in a pre-opening preview. When Legoland Malaysia Resort opened its doors, it joined five other Legoland parks located in Denmark, England, California, Germany and Florida, as the sixth Legoland park in the world. At that point, construction was in progress on the adjacent Legoland Water Park and Legoland Hotel. When these two attractions opened in November 2013, the 249 family rooms in the hotel designed in Lego themes, welcomed guests to enjoy the Lego experience beyond their day in the park. I have lost count of the number of times that I visited the park but I can clearly remember the exciting events for the many media previews where I enjoyed sneak peeks and first experiences for festive and new attractions. I remember the event in June 2015, graced by His Majesty Sultan Ibrahim, for the launch of the miniature of the Bukit Serene Johor Sultan’s palace. I felt a strange sense of pride because this grand palace joined the collection of iconic landmarks in Legoland Malaysia Miniland. During the event the master model builder shared his comments about how he and his team went about recreating this palace, made up of 278,023 Lego bricks and that it weighed 350kg. The extensive process to replicate it in Lego bricks included surveying the location, computer rendering and matching the brick colours, construction of the model and post production to ensure that the integrity of the model was preserved. I cannot forget the mention of a cat on the roof and because it was a quirky part of the palace, the model makers ensured that this pesky cat was also featured in the miniature Bukit Serene Palace in Miniland! wall mural by artist, Taib Aur, replicated in Lego bricks! Legoland Malaysia is constantly maintaining the park exhibits and wants Annual Pass Holders to enjoy something new and refreshed on each visit, so they work hard to come up with innovations and ideas to enhance the visitors’ park experience. It was exciting to learn that the JB cluster will be refreshed with a replica of the city’s heritage quarter. In the studio, I watched teams working on Lego replicas with amazing detail on familiar landmarks in our Street of Harmony like Johor Gu Miao or Old Temple and Sri Mariaman Raja Devasthanam Hindu Temple. I also saw work-in-progress to replicate the recently restored prewar shophouses and Broadway cinema in Lego bricks and cannot wait to see the completed cluster! As the studio teams get to know the heritage quarter better, I trust our city council will also continue to preserve the heritage heart of JB for future generations to enjoy. I’m sitting in the semi-darkness along with an audience, mesmerized by the performance of Erwin Shah Ismail, in a one-man act dubbed, Kulit On The Go. I settle comfortably into my seat, ready to be impressed and entertained because the pleasure derived from watching a monologue largely depends on the knowledge and imagination of the audience. Armed with a travelling bag and minimum props, this monologue – written and performed by stage and screen actor, Erwin Shah Ismail – is presented on the first day of the month-long 15th Johor Arts Festival. In the opening scene, as Erwin sings while strumming his ukulele, I’m already charmed by the timbre in his voice. The voice pitch of the actor is pivotal, particularly in a monologue as it conjures images and ideas merely from his voice and accent. I liked how Erwin comfortably morphs into a range of characters – recognized mainly through his voice – and the use of simple props. He dons a wide brim Stetson hat and struts about with hands in his pockets and speaks American English with a heavy Texan drawl. It takes a bit of time to make out what he’s saying from the obviously lengthened and drawn-out vowels but he cuts a mean portrayal of a typical character out of the Wild West. He warbled away, discussing the topic – from farm to fashion – about how cows are bred for milk and meat, and how its hide is turned into durable fashion accessories like quality bags, belts and shoes. The clever play of lights keeps the focus on the actor who moves across a small space to bring the audience with him to various scenes in the drama. Erwin is Singaporean Malay and I give him full-marks for being so comfortably multi-lingual in Chinese language, both in Mandarin and Hokkien dialect. Then Erwin is at home with his mother and they chat in Malay. In a typically Malay scenario, he sits on a woven mat spread out on the floor, to have tea. Later he puts on his artisan’s apron and sits down to craft a leather accessory from a piece of cow hide while giving the audience blow-by-blow instructions on how to achieve the best results. Erwin skillfully engages with the audience and even invited individuals to participate with him as part of the performance. The message of the monologue is achieved when thought-provoking seeds are planted in the minds of the audience, to take home and ponder upon. At the close of the show, the audience is invited to stay as the actor and director pull up chairs and sit down for a chat with the audience, within an intimate circle. This show is the result of a collaboration between Erwin and director, Richard Tan, better known as Baba Richard for his straits-born heritage, for a commissioned 20-minute monologue back in 2016. They tell us that since the first show, the drama had organically evolved to what it is today. It is a highly “portable” show with the props conveniently packed into one travelling bag. When the time was ripe to “take it on the road,” Johor Baru is its first stop as part of the first leg of their first international tour. This is only the beginning for Kulit On The Go. It still has a journey to travel before this monologue can be fully appreciated for what it’s worth. Maybe one fine day, we can look back on this first show in JB in its international tour – which made history – and then see how far this monologue has gone? So I leave, pondering on cow hide and tanning, the cow population vs humans, methane and vegans and how a Malay young man, using multi-languages in a monologue, successfully engaged the attention of a mixed audience of Asians and non-Asians.